Waimanu Valley is a remote valley on the northeast coast of Hawaiʻi island. 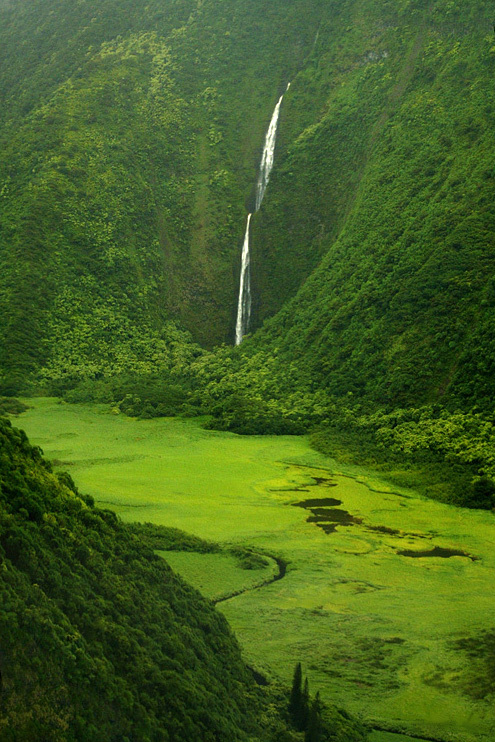 Besides the main Waimanu Stream, it includes Waihīlau Falls on a tributary. Wai manu literally means “bird water” or “river of birds” in the Hawaiian language. During the time of Ancient Hawaii it was an ahupuaʻa, or ancient land division with a small village. Most of the area is state forest land, with a few campsites available with reservations. It is located in the Hāmākua district of Hawaiʻi island. The Waimanu Stream watershed includes many smaller flows from Kohala Mountain to the Pacific Ocean at sea level. A system of dikes of hard lava rock force large amounts of ground water dropped from the tradewinds into this valley, making it very different from the smaller shallow valleys directly to the west. This ridge is administered as the Puʻu O ʻUmi Natural State Area Reserve.